Could you live on $4.06 a day? We talk a lot about the food we have in our distribution centers and how we provide it to folks in need through our partner agencies. But the truth is food pantries and soup kitchens in our network, while vital to our efforts, are not the first line of defense against hunger. They’re the last resort. Our mission is “No One Goes Hungry in Central & Eastern North Carolina,” and to that end, we distribute food to emergency food assistance centers which then provide the food to people in the community. Food pantries represent a critical part of the hunger relief network, but they are never meant to be a long-term solution to hunger. They help folks through a rough patch, providing enough food to get them through a few days. But hunger has become such an epidemic that those rough patches seem to never end for so many people in our region. Food insecurity has become a chronic reality for over half a million people in our service area, and to truly fulfill our mission, we must employ a comprehensive and sustainable approach to solve hunger. One of the ways we do that is through Three Squares for CENC, the Food Bank’s Food and Nutrition Services Outreach Program. Through this effort, our dedicated outreach coordinators visit our partner agencies including food pantries and senior centers to help clients navigate through the Supplemental Nutrition Assistance Program (SNAP), known as Food & Nutrition Services (FNS) in North Carolina, ultimately helping them to complete benefits applications. Our relationship with partner agencies in Edgecombe, Lee, Moore, New Hanover, Onslow, Pamlico, Pender, Pitt, and Wake counties make applying for FNS benefits convenient and less stressful. Our staff brings the application process to the clients, allowing them to complete the forms in a familiar setting. We also answer any questions the client may have up front, helping to reduce the anxiety and barriers that many people experience when trying to navigate the FNS program. So how does it all work? First we must determine if a client is eligible based on their income and the poverty level. If they are, we help the client complete and submit the FNS application. After an intake interview with their local Department of Social Services FNS worker, which can be completed over the phone, they must wait for approval. Upon approval, their benefits are mailed to them on an Electronic Benefit Card (EBT). This process can take up to 2 weeks for those deemed in an “emergency situation,” or those that earn less than $150 a month, and about 4 weeks for all other applicants. EBT cards can only be used to purchase grocery items. This does not include non-food essentials such as toilet paper, diapers, or prepared foods such as meals from the deli. The average monthly benefit per person in North Carolina is $121.85, and it often is not enough. In a report done by the USDA, Benefit Redemption Patterns in SNAP, it was found that most families use 90% of their benefits by the third week of the month, forcing them to make tough choices such as paying for food or utilities, groceries or healthcare. These choices have an especially devastating effect on vulnerable populations such as kids and seniors. In the USDA’s report Characteristics of SNAP Households, 76% of participating households were found to include a senior, child, or disabled person. “I worked my whole life, and now, I live only on my Social Security. By the time I pay for my rent, light bill, water bill, and insulin, I don’t have money to buy food. I receive $38 a month, and that just isn’t enough.” –Carolyn, a senior and lifelong Wilmington resident. 1 in 6 people in North Carolina benefit from the FNS program. The monthly allotment helps provide a little breathing room in their budget, alleviating some financial anxiety and providing a path out of food insecurity. And yet we know there are stigmas, shame, and negative connotations connected to hunger, poverty, and the very act of receiving food assistance. We hope to mitigate these perceptions and misconceptions through education, awareness, and supporters like you. That’s why this week we’re taking the FNS Challenge to encourage folks to get a sense of what life is like for thousands of people in our state that live on just $4.06 worth of food each day. While living on a FNS budget for just 5 days does not come close to the struggles encountered by low-income families week after week and month after month, the FNS Challenge does provide a new perspective and greater understanding for participants, helping them to realize the importance of proper nutrition in their life and how a lack of food affects their mood, focus, performance at work, and outlook on life. So join us for the Challenge and live on just $4.06 per person per day. We hope it will inspire you to think differently about the way you eat, the way food affects your life, and the way we can provide not just hunger relief but a path out of food insecurity to our neighbors in need. 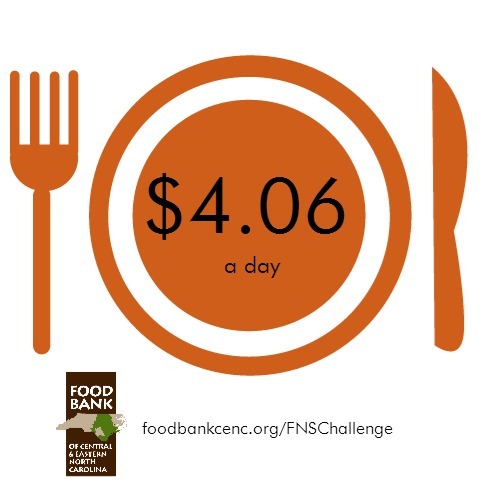 To register for the Food Bank of CENC’s FNS Challenge, visit our FNS Challenge page. To learn more about our FNS outreach efforts, visit our Three Squares for CENC page.